This is not a book on NO biology, nor about hemoglobin, nor about heme-based sensors per se. Of course, it covers all these topics and more, but above all, it aims at providing a truly multidisciplinary perspective of heme-diatomic interactions. The overarching goal is to build bridges among disciplines, to bring about a meeting of minds. 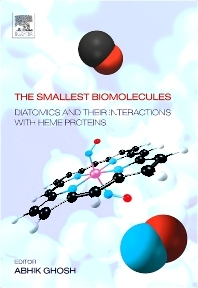 The contributors to this book hail from diverse university departments and disciplines – chemistry, biochemistry, molecular biology, microbiology, zoology, physics, medicine and surgery, bringing with them very different views of heme-diatomic interactions. The hope is that the juxtaposition of this diversity will lead to increased exchanges of ideas, approaches, and techniques across traditional disciplinary boundaries. The authors represent a veritable Who’s Who of heme protein research and include John Olson, Tom Spiro, Walter Zumft, F. Ann Walker, Teizo Kitagawa, W. Robert Scheidt, Pat Farmer, Marie-Alda Gilles-Gonzalez, and many other equally distinguished scientists. Covers the hottest topics in heme protein research: sensors, NO biology, new roles of hemoglobin, etc.